On March 17, 2019, about 1745 eastern daylight time, a Cessna 421B airplane, N424TW impacted terrain near Plain City, Ohio. The commercial rated pilot, sole occupant, was fatally injured and the airplane was destroyed. The airplane was registered to Classic Solutions, Inc. and operated by Phoenix Test Flight, LLC, as a 14 Code of Federal Regulations Part 91 flight. The flight departed Dayton (KDAY), Dayton, Ohio about 1720, en route to (KDLZ) Delaware, Ohio. A preliminary review of radio communications revealed the pilot was in contact with air traffic control and there was no record of a distress call. The pilot requested runway 28 RNAV approach at KDLZ. The pilot also reported that he was encountering icing. The controller cleared the flight to 2,500 ft. Shortly afterwards, the airplane made a left turn, and radar and radio communication were lost. The airplane impacted a rural field about 8 miles southwest of the KDLZ airport. Ground impact scars and wreckage were consistent with a left-wing low impact. The wreckage path was orientated on about a 140-degree heading. From the initial impact point, the airplane crossed a two-lane road before impacting two wooden utility poles. The main part of the wreckage came to rest at the base of the second utility pole, about 395 ft from the initial impact point. The wreckage path was about 850 ft long with the wreckage highly fragmented along the wreckage path. There was not a post-crash fire. After documentation of the accident site, the airplane was recovered for further examination. 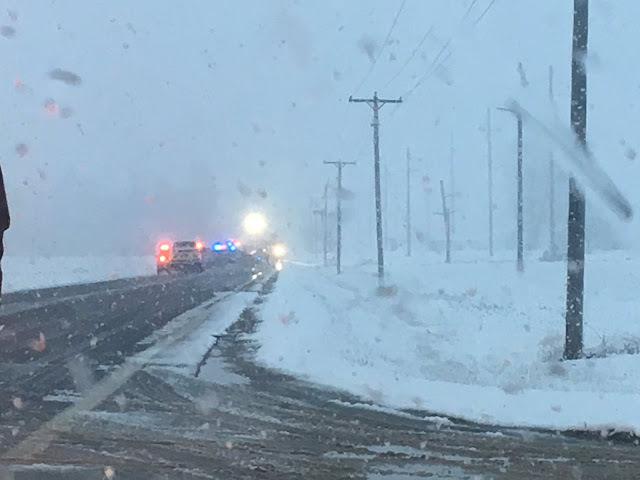 PLAIN CITY — An experienced Air Force fighter pilot from Arizona died Sunday when a Cessna plane he was flying in snowy weather crashed in a field off Route 42 in Union County. Matthew A. Hayden, 44, of Phoenix, had taken off from Dayton International Airport at 5:17 p.m. and was headed to Delaware Municipal Airport in Delaware County, according to the Union County sheriff’s office. The Cessna 421B Golden Eagle II was owned by Classic Solutions Company Inc. in Bakersfield, California. Hayden had just picked up the plane at the Dayton airport, Union County Sheriff Jamie Patton said. He said Hayden was flying to Delaware to meet a friend and was expected to move on from there to another destination. The eight-seat Cessna he was flying went down at 5:42 p.m. near Route 42 between Harriott and Bell roads in Jerome Township, about 7 miles northeast of Plain City and near the Delaware County line. The aircraft broke into hundreds of pieces in the field. A witness heard the plane descending and then the crash, and called 911 as he headed to the scene. He stayed on the phone as he came upon the wreckage. 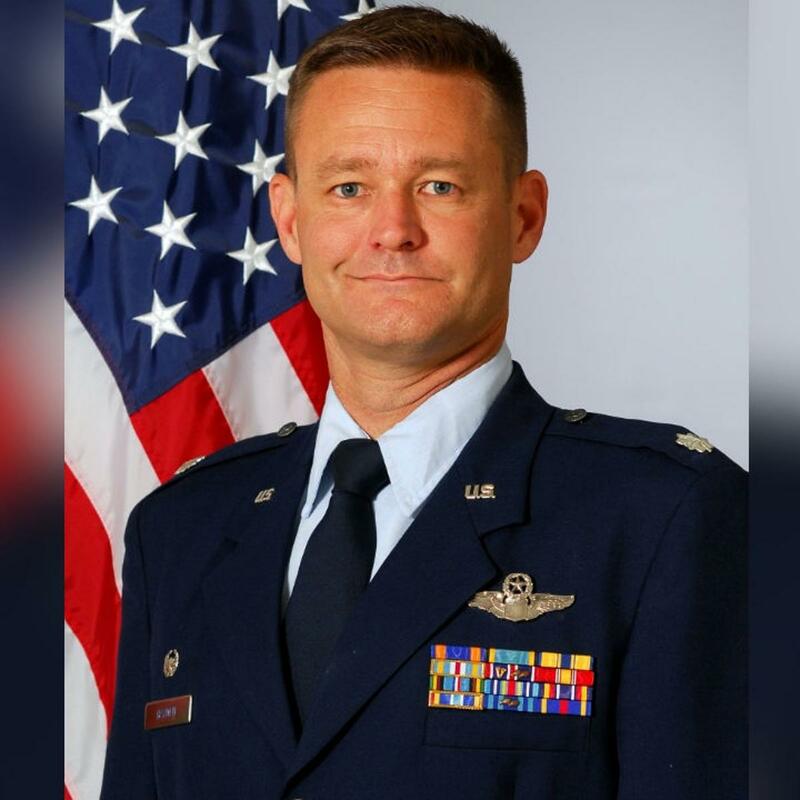 Patton said friends of Hayden’s told authorities that he had only recently retired from the Air Force as a lieutenant colonel. Hayden was a 1998 graduate of the U.S. Air Force Academy and a renowned military pilot and flight instructor. He had served as a test pilot in both the F-16 and F-35 fighter jets and had piloted the F-16 in Operation Iraqi Freedom. The public-affairs office at Luke Air Force Base in Arizona, where he last served, said officers who knew Hayden were all saddened by the news Monday. His list of accomplishments is long, and the Air Force said he had more than 2,500 flight hours in at least 30 types of aircraft. He made his mark as a test pilot in experimental aircraft, and he had been, before his retirement, a commander of the 56th Training Squadron at Luke. Craig Hatch, an investigator with the National Transportation Safety Board, arrived on the scene about noon Monday. He said it’s too early to say whether the snowy weather on Sunday was a factor in the crash. Hatch said Hayden reported no problems over his radio before the crash. Debris stretched across fields on both sides of Route 42. 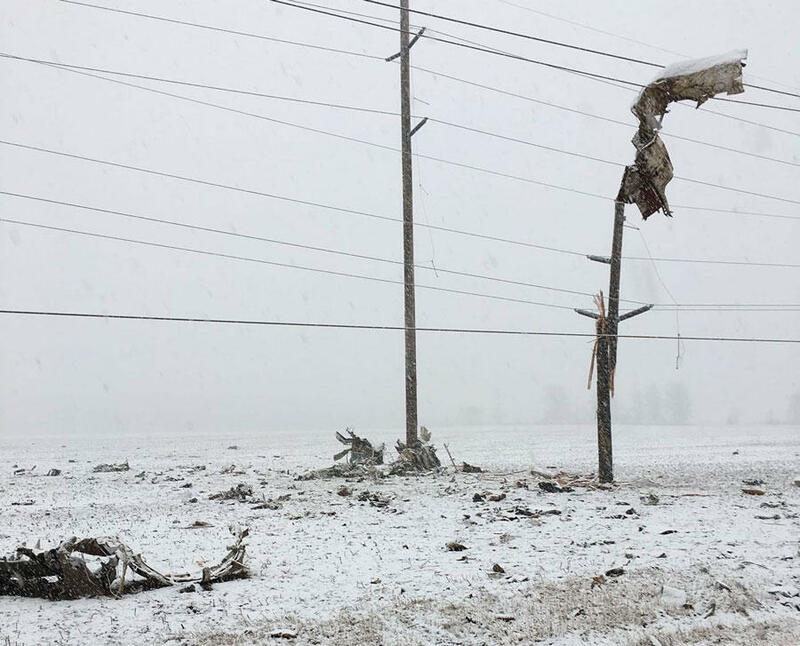 Power poles were also sheared off or otherwise damaged. Route 42 from Route 33 to the Delaware County line was closed until about 4 a.m. Monday for the investigation. 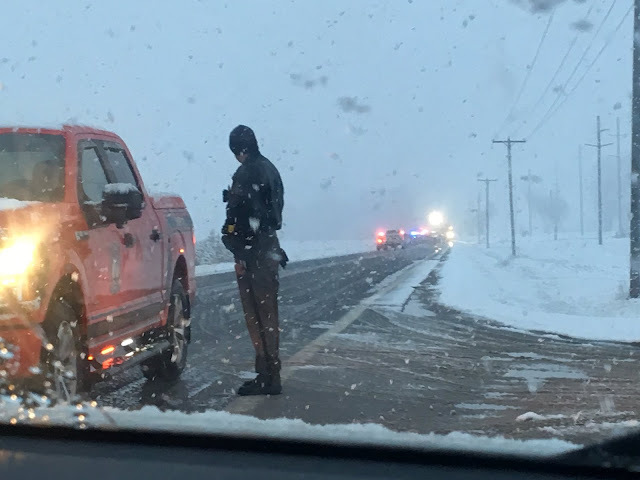 The highway was shut off again in the afternoon for about two hours while investigators gathered evidence; it reopened about 3:30 p.m.
Hatch said he hoped to have all the wreckage cleared away Tuesday. He said the full investigation could take a year. MARYSVILLE, Ohio — Authorities have identified an Arizona pilot who was killed when the small plane he was flying crashed into a farm field in Ohio. The Union County Sheriff's Office said Monday that 44-year-old Matthew Hayden, of Phoenix, died Sunday night when the Cessna 421B Golden Eagle II crashed off Route 42 near the border of Union and Delaware counties. According to Luke Air Force Base, Hayden was a Lieutenant Colonel with the 56th Training Squadron. Hayden's bio stated he was one of the most experienced F-35 pilots in the world, and has flown and instructed new pilots at Luke AFB since the inception of its program. Hayden also made history as the first Luke AFB pilot to reach 500 flying hours in an F-35 Lightning II. An investigator with the National Transportation Safety Board says it's too early to determine what caused the crash. It was snowing and overcast at the time of the crash. The plane was identified as a Cessna 421C Golden Eagle. Chief Deputy Morgan said it was "totally destroyed." 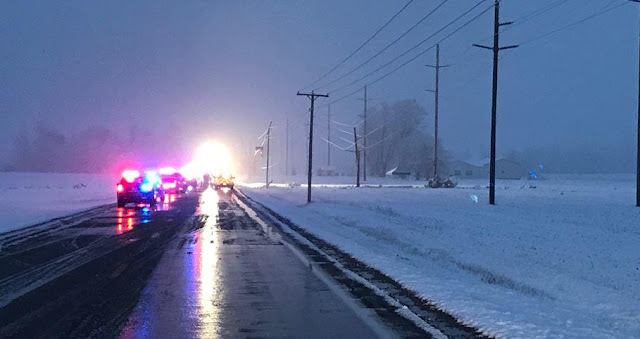 MARYSVILLE, Ohio (WSYX/WTTE) — A man was killed when a Cessna 421 twin-engine airplane swung low over rural Union County on Sunday, violently crashing into utility poles along Route US-42. The victim was later identified as 44-year-old Matthew Hayden of Phoenix. The crash left a debris field stretching 400 yards wide on either side of the roadway, according to the Union County Sheriff's Office. "(The plane) is totally destroyed. Literally, hundreds of pieces everywhere," said Chief Deputy Tom Morgan. 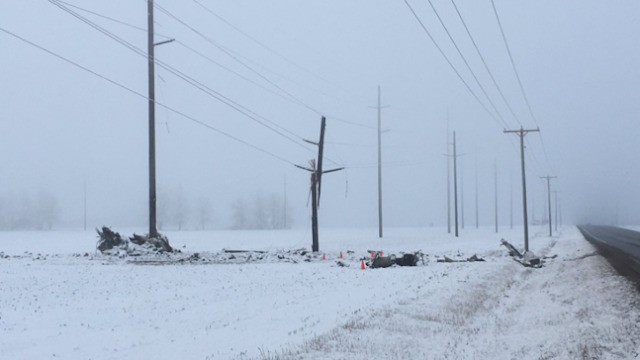 "When it crashed into the farm field, it continued across US-42 and struck utility poles and utility lines." The crash shattered at least one pole and brought down wires, leading to widespread power outages. Morgan said that most Ohio Edison customers in Plain City were impacted. An outage map for Union Rural Electric Cooperative showed about 2,500 more customers without power in Jerome Township and Concord on Sunday evening. The Federal Aviation Administration joined the investigation Sunday night, which will aim to determine where the aircraft originated from and where it was headed. During the time of the crash, Union County was swathed in a small but intense band of snowfall that made for whiteout conditions on local roadways at times. Morgan said further snowfall after the crash had hampered the early stages of the investigation, as debris quickly became covered with snow. Only one witness is known to have heard the crash, according to Morgan. Any other witnesses are asked to call the Union County Sheriff's Office at (937) 645-4110. 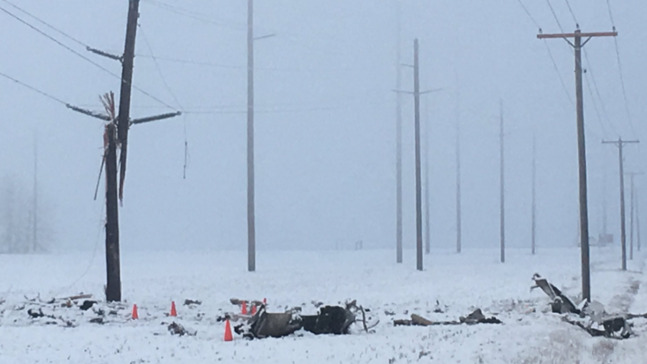 MARYSVILLE, Ohio — One person was killed when a Cessna 421B Golden Eagle II swung low over rural Union County on Sunday, violently crashing into utility poles along Route US-42. The pilot has not yet been identified. 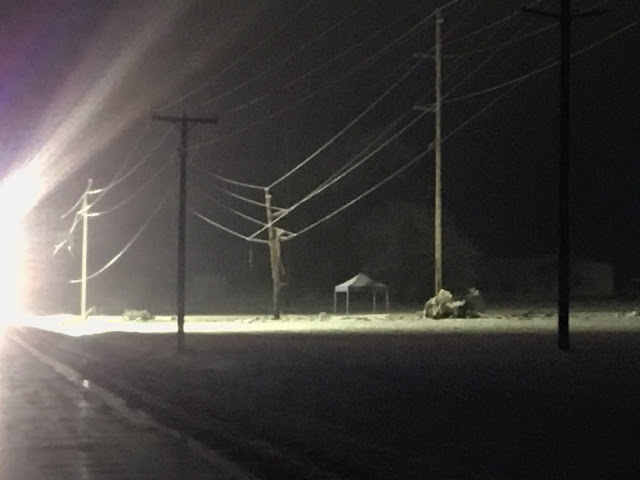 The collision shattered at least one pole and brought down wires, leading to widespread power outages. Morgan said that most Ohio Edison customers in Plain City were impacted. An outage map for Union Rural Electric Cooperative showed about 2,500 more customers without power in Jerome Township and Concord on Sunday evening. Delaware, Ohio - The Federal Aviation Administration and the Union County Sheriff's Office is investigating a deadly plane crash that happened near U.S. 42, yesterday. According to the Union County Sheriff's Office, at about 5:42 pm, Sunday, dispatchers began receiving several 911 calls reporting a plane crash on U.S. 42, between Harriott and Bell roads. When emergency crews arrived on scene, they found the crash site stretching approximately 400 to 500 yards. A preliminary investigation has revealed the plane crashed in a farm field on the west side of U.S. 42 and continued across the roadway, striking several utility poles before coming to a rest in a farm field on the east side of U.S. 42. Deputies say the Cessna 421B Golden Eagle II broke apart in several hundred pieces. One person was pronounced dead from the crash, but their identity has not been confirmed. 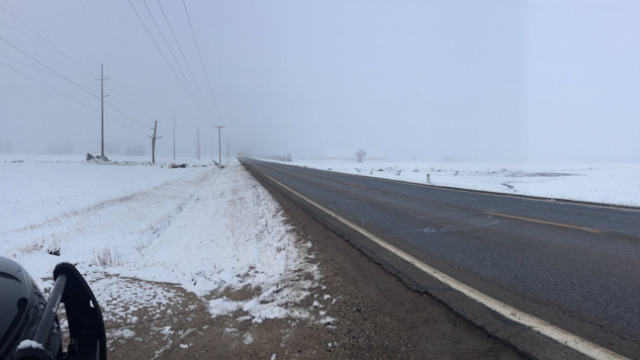 The Federal Aviation Administration continues to investigate, but according to deputies the weather at the time of the crash was light snow with overcast skies. I feel badly for these folks. Today I was flying the PA-28R-180 southeast out of Chicago and nearly got to Lafayette IN and realized the snowstorm had broadened in front of me. I dropped down in an open slot from 9500 feet (VFR over the top) and realized the was broken scud down to 200' and the windmill rotors were topping into the scud base. I looked for a rural runway and could not even see it from 1200' up. It was time to get out of there and ended up climbing back up on top and flying 75 nm west to Bloomington IL to find VFR to the ground, a snow cleared runway and good overnight accommodations. I decided to break the accident chain. Tonight i had a good meal in a hotel restaurant. I only wish these folks who perished would have done the same. N424TW. Final couple of minute show the pilot was clearly in trouble. RIP. Very easy to get vertigo when flying thru falling snow, must stay very focused on instruments and turn outside lights off. Another case of spatial disorientation in IMC in a piston-twin. Same ending as the Yorba Linda crash but without ground fatalities. You can see his FlightAware flight track where he starts to lose it and enters a graveyard spiral. Sad ending to the pilot & plane. Sounds like you got luckIer that the guy in 421c. I prefer reading about this than participating. This happened a few miles north of my house. Weather was absolutely horrible with heavy snow and minimal visibility. Hugely challenging for a GA aircraft trying to land. I believe the pilot was military or ex-mil out of Luke AFB in PHX if bio is correct. Very sad .. RIP. I believe every C421 came with an autopilot. If you get spatial disorientation turn the a/p on and get your head together; unless of course the autopilot was inop. Just because you're instrument rated and have a capable all-weather plane doesn't always mean you have to launch into known bad weather. Sometimes you have to say I'll wait until better weather and fly another day. The pilots I know say if you positively have to be somewhere take a commercial airline flight and let the pros handle it. I listened to archived atc for this flight, first thing that caught me attention was his read back of atc clearance, only read back squawk code, to cool to read it all back, bad sign. Next when he switches to dep the controller keeps questioning altitude and headings, guy was in trouble 5 minutes after takeoff, I know his bio reads of f-16 and f-18s and lots else in that line up, over 25o0hrs tt, instructor pilot, however, a 1973 Cessna 421 is not for someone not really current in it, not to mention the ifr conditions.Some higher time/jet pilots tend to treat these type and conditions below us, because we fly big fast jets, single pilot hard ifr is harder then flying your f16 around. USAF recently retired Lt. Col.
How many hours / experience did he have on the C421 or GA aircraft in general? How familiar was he flying GA aircraft in bad weather / IMC? Mil jet hours do not count in this environment. First, it was a '74 421B model (not C) with tuna tanks. 2nd, Mil flying (high-performance jet) is totally different than GA, especially piston GA. 3rd, pitot-tube icing (should tell by switch position), alternate air (not sure if this is applicable)? 4th, autopilot? 5th, higher altitude (3000msl, ~1900agl) - true it's a 65-mile flight, but I'd be thinking at least FL050 depending on the ceiling, layers, wind (IMHO). 6th, squawk readback only (according to another person)? 7th, ~5:30pm departure couldn't wait 'til first-thing the next morning (firsthand - it was snowing HARD around this time). 8th, were boots activated, were they working? 9th, was KDLZ WX even legal for VOR/GPS approaches, wx was near zero-zero white-out (from personal observation) on I-71 (10sm east). 10th, hours in type, training, last flown, etc. Lastly, this post isn't to cast aspersions nor be critical, just the first questions I'd be asking. Thoughts and prayers with family, and thanks (as a fellow former Air Force officer) for his service. Break the accident chain? Not really understanding that comment. Should have said, “got lucky” as stated following comments. PS - forgot to mention aircraft airworthiness condition - #11 aircraft maintenance history, inspections, TT, SMOH (motors & props), AD's, corrosion (I believe there's a major AD for spar corrosion), etc. Tuna tanks are the earlier tanks, never put onto the 421 series. Early 310 tanks as well as early 320. Just don't want anyone to get embarassed at the coffee pot at the FBO! stalled at apex, 4000+ feet, maybe a stall spin roll......he was either dead or totally incapacitated......I wouldn't rule out a disconnected elevator trim pushrod. See the "AD"? Pilot was alone, forward cg = lots of stress on the trim tab. Notice he steers SE thru a gap in weather...observe the BOW ECHO weather event. Sh*t hits the fan when he penetrates the gust front? Just observations. For an anonymous poster who hangs out at the FBO coffee pot.. you should spend more time in research and less time drinking coffee. 1974 C421B had tip tanks just like the C310 and C320 (tuna tanks). Later models of the C421 went with the straight wing. The 421 never had "Tuna Tanks". It had tip tanks, yes. The tunas where roundish and didn't look very aerodynamic. The later tanks had a nice looking profile. my apologizes to any I may have offended. I had completely forgotten the difference between the "tuna tank" (like on Sky King's 56 C310 and the tip tanks on the early C421, which were the more aerodynamic version. actually , upon doing my research, the first Sky King 310 was a 1957, C310B. Looking at the tracker, it looks like he hit the front of the squall and encountered severe turbulence with altitude variations +/- 500 ft. or more. The updrafts dropped his airspeed and a stall in IMC with ice accretion to boot (no pun intended) and steep bank angles made recovery unlikely. In that type of turbulence, he’d be lucky to be able to read his instruments let alone get any useful info from them even if he could. The comment about only reading back the squawk code needs some context. The controller cleared the pilot "as filed." If the flight is cleared in such a manner there is no need to read the entire course back to the controller. In fact, it's far more succinct to simply read back the squawk code because that's the bit of information the pilot wouldn't have before getting a clearance. The pilot mentioned icing but the 421 can handle ice pretty well, assuming anti-ice was selected and pitot head was on. If the pitot iced up that could lead to some weird speed indications and could make flying in IMC challenging. It really does look like a graveyard spiral from the flight track. It's too bad, the pilot seemed like a well accomplished guy.